Grand Central Publishing, 9781455598526, 288pp. In the vein of Richard Russo and Tom Perrotta, a gripping, suspenseful, and gorgeous debut novel--told hour-by-hour over the course of a single day--in which a husband and wife try to outrun long-buried secrets, sending their lives spiraling into chaos. Jennifer Kitses is the author of the novel Small Hours. She received an MLitt in creative writing from the University of St. Andrews in Scotland, and has worked for Bloomberg News, Condé Nast Portfolio, and Columbia Business School. Her fiction has appeared in Akashic Books' online series, Mondays Are Murder. She lives with her family in New York. 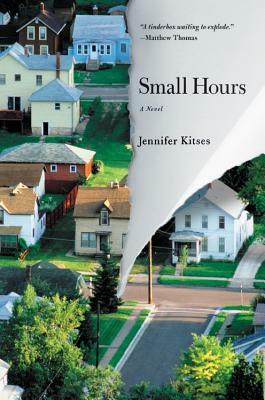 "Jennifer Kitses slowly and artfully turns up the flames in her debut novel until Small Hours reaches a raging boil. Tom's and Helen's disparate twenty-four hours, wracked and ruined by a jumble of anxieties and miscues, unravel with the tension of a thriller and the gimlet-eyed observations of a novel of manners." "In her page-turner of a debut, Jennifer Kitses has captured the spirit of Tom Perrotta and Richard Russo, painting a dramatic portrait of a suburban marriage on the rocks. She shows all too well the emotional pitfalls of working parenthood and the precipice that so many of us navigate every day. A rich, searing, and unforgettable novel." "Jennifer Kitses really illustrates very well the palpable sense of constant stress that this couple is feeling. It's like a runaway train...It brought up a lot of questions...What do we owe the people we love, in terms of honesty and truth? ...Can you decide that honesty in a relationship is not necessarily telling everything?"